The Air Pollution Sampling Pump and Detection Outfit together are a kit, which quantify six different pollutants in the air. The sampling pump is a vacuum that draws air from outside the collection bottle and pulls it through an absorbing solution that is chemically sensitive for a particular gas. The vacuum pump has an adjustable flow meter that can sample between 0.1 to 2.0 liters of air per minute. The Dectection Outfit is comprised of six individual test kits, including the solutions, reagents, and special equipment necessary to test for nitrogen dioxide, chlorine, total oxidants, ammonia, sulfur dioxide and lead air pollution. Each test kit contains an absorbing solution, which is poured into a glass bottle called the impinger. Two narrower tubes are held inside the impinger by a rubber stopper - one is long and one is short. The longer tube should be immersed in the absorbing solution when air is being collected. Air is pulled out of the impinger by the vacuum pump through the short tube, which draws air into the impinger from the outside air via the long tube. Because the end of the long tube is submerged into the absorbing solution, the air must be pulled throu the absorbing solution before it is pumped out of the impinger. Requirements: The kit is completely portable and can be used outside or inside the classroom. The sampling pump can run off batteries or electric power. Check the battery power on the pump. If the flow meter indicator float vibrates up and down with a defection of more than 0.2 Lpm, or if the flowmeter cannot be adjusted to collect a sample at 2.0 Lpm, this indicates that the power supply is too low to collect air at a constant volume for an extended period of time. Replace the batteries or use the AC adapter. Review the procedure outline in the individual test kit for the specific test you are performing. Each chemical analysis has its own absorbing solution, reagents, and procedures. Fill the impinging tube to the designated line with the absorbing solution. Insert the stopper assembly. The LONGER narrow tube should be immersed in the absorbing solution. Connect the SHORTER impinger tube to the pump intake fitting ("IN) using the flexible tubing. Outside the impinger, the flexible tubing should connect the shorter narrow tube just above the rubber stopper, to the "IN" intake fitting of the pump. DO NOT connect the inlet tube of the impinger (which is now below the surface of a liquid) to the IN fitting of the pump as this will break the pump. Turn switch to "ON" position and adjust the flowmeter. Turn pump on by pushing the ON/OFF button. 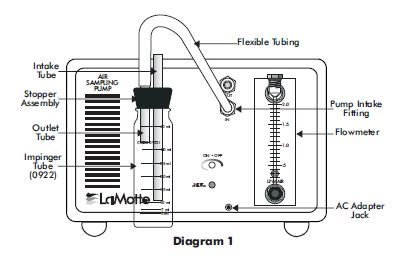 Adjust the flowmeter to sample at the designated rate (according to individual test specification) by lining up the float with the value on the scale. Run the pump for the amount of time designated by the test type, and then turn pump "OFF." At the end of the sampling period, turn switch off and continue with the testing procedure as outlined in the individual air pollution test instructions.